You know how when you get older you get nostalgic about things? It starts off slowly with a longing for high school summers and football pep rallies. And before you know it, nostalgia graduates to celebrating the number of years gone by since this event and that milestone. Well yesterday I got nostalgic about an anniversary like none other. Yesterday I celebrated the fifth anniversary of my new jaw. 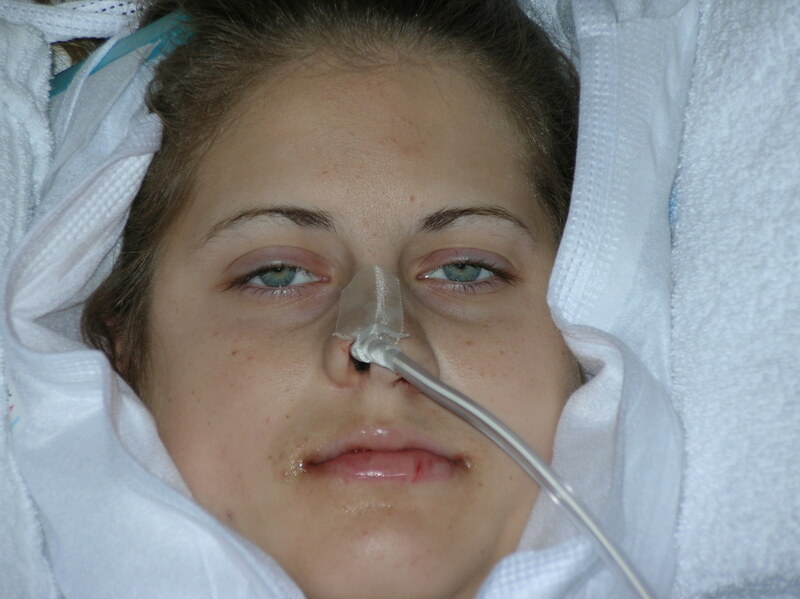 Yep, five years ago on June 15th, 2006, I went under the knife to fix an underbite that had plagued me forever and caused pretty bad TMJ disorder. It affected my breathing, sleeping, eating, speaking, candy-consuming and gum-chewing. I was in pain a lot of the time, had headaches that wouldn’t go away, and took a lot of ibuprofen. So for years we planned, met with doctors, waited for my adult teeth to come in (I didn’t get my last one until sophomore year of college) and I suffered through one orthodontic apparatus after the next. And finally, the day before surgery, I got scared. I sat on the deck re-reading a pamphlet on what to expect with orthognathic surgery, learning how many things could go wrong and anticipating that I might lose my sense of smell or never regain feeling in my face. I was scared but I knew I had to go through with it. I had no choice. I wasn’t really scared of the surgery as much as the recovery: On top of recovering from the standard effects of surgery and anesthesia, I would have my jaws wired shut for six weeks which would keep me on a liquid diet (no straws allowed) until the wires were cut at which point I could attempt to eat soft foods. It was not a very easy thing to look forward to. Before my surgery, when I bit down my teeth looked crazy. 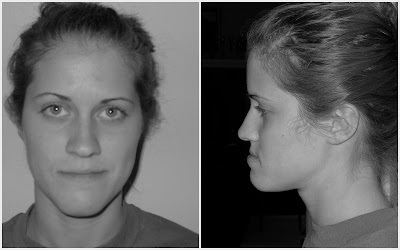 My bottom jaw was noticeably much further forward than my top jaw. You may be able to tell why I hadn’t bitten into any sandwich or piece of fruit or anything in many years. So there I was, full of sweet and sour chicken, well aware that I needed this surgery but shaking in my boots about the outcome. I resolved that it was going to happen regardless of whether I was scared or not, so I just decided to breathe and go with it. And the next morning I was in the hospital, tubes in my arm and nose, getting my bottom jaw moved backward 5 or so millimeters. I looked absolutely gorgeous when I woke up. My face was surrounded in ice packs and towels and my jaws were wired shut. I was in no shape to get up and walk over to the mirror in the bathroom, so I asked Mom [by writing on a notepad] if she could hold a mirror up for me. Even through the swelling and the cut, vaselined lips, with the nasogastric tube coming out of my nose, I could already tell that things were better. I opened my lips slowly and cautiously (they were completely numb) and the sight of my top teeth resting in a wonderfully average way over my bottom teeth brought tears to my eyes. Despite the glimmers of hope I experienced before I left the hospital the next morning, it got worse before it got better. And because I have no shame, I’m sharing my it-got-worse pictures with you. 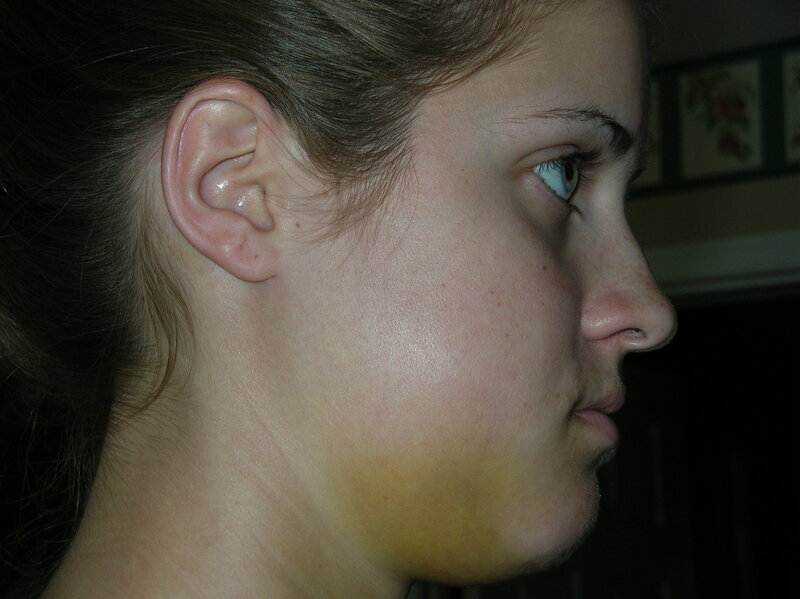 During the first 48 hours, the swelling got really bad and my upper half was overwhelmingly hot all the time. So my Mr. 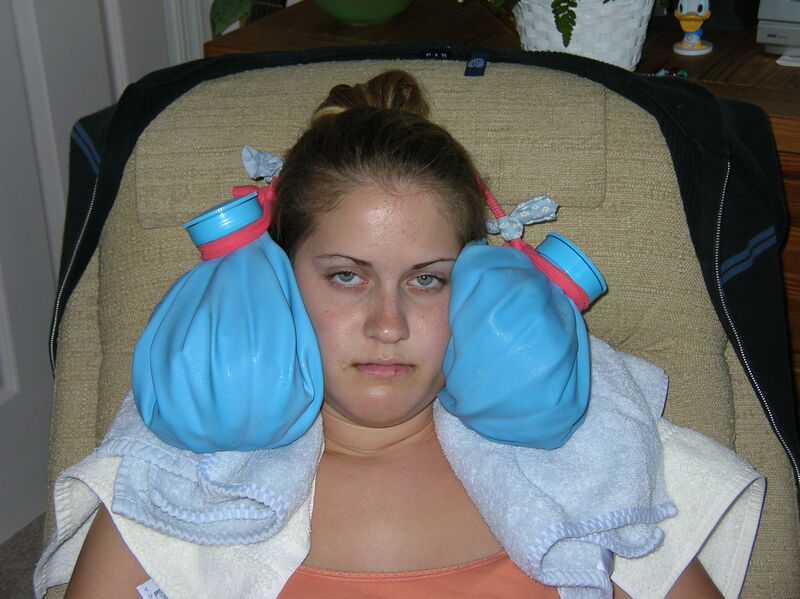 Fix It Dad rigged a double ice pack contraption to keep my face cool. In the above picture you can see that not only my face swelled, but so did my chest and neck. I was overjoyed about the swelling and the photo shoot. As the days passed the swelling shifted to just my cheeks, giving me that irresistibly cute chipmunk look, and the bruising started to appear. It was green and yellow and all over my face, neck and chest. Also, my eyes were bugging out. Gross. After a few blender recipes gone awry (the effort was appreciated Mom! ), countless mugs of chicken broth, and sneaking tiny pieces of cheese in through the cracks of my teeth, I got the wires clipped 6 weeks later. I was hungry, 15 pounds lighter, and headed straight for a spoonful of mashed potatoes. By the time I moved in to the Blacksburg apartment with Jessie and Jess in August I was eating peanut butter toast on the regular. And another month later I came home to get my braces taken off. It was weird. I looked like everyone else, I could eat what I wanted to eat and I wasn’t in pain. And now, five years later, that struggle seems like it was just yesterday and a million years ago at the same time. I smile like a normal person now. Though my left cheek is still numb. Posted on June 16, 2011, in 25, Celebrations and tagged jaw surgery, life, nostalgia, orthodontics, recovery, surgery. Bookmark the permalink. 7 Comments. Tears from Aunt B too, including happy ones. GREAT photos. Really made me feel I there in the misery. My favorite is the yellow bruise. Lets have some lobster bisque and calm chowder pureed in celebration! wow! great post! i learned something very interesting. All I can say is congrats, for feeling great and pain-less(: Happy 5th Anniversary!